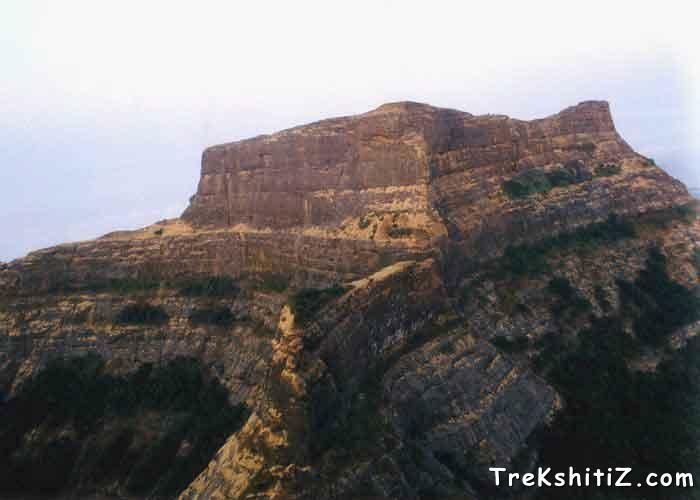 Madangad is considered to be one of the most difficult forts to climb among all the forts in the Sahyadris. The fort is quite old and also impregnable. The most appropriate time to trek this region is between December and January. The area of the fort is quite small as compared to Alang and Kulang, its adjoining forts. There are only two water tanks on top of the fort in which water is available only till February. There is a cave, which can accommodate around 15-20 trekkers at a time. The area visible from the top of the fort is quite scenic. One can see Alang, Kulang, Chota Kulang, Ratangad, Ajyagad, Katrabai, Dangya Pinnacle, Harihar and Tryambakeshwar. It takes only half an hour to see the complete fort. There are two routes to go to the top of the fort. Both these routes go via the ridge between Alanggad and Madangad. The first stop is either Igatpuri or Kasara. There is Igatpuri / Kasara � Ghoti � Pimpalnermor � Ambewadi S.T. service. There are also ST services from Ghoti to Ambewadi. The distance between Ambewadi and Ghoti is around 32 Kms. The first S.T. Bus to Ambewadi from Ghoti leaves at 6.00 a.m. The three forts of Alang, Kulang and Madan are visible right from Ambewadi village. There is a route to reach the intersecting ridge between Alang and Madan. This route is quite steep and exhausting. It takes approximately 3 hours to reach the ridge. Once u reach the ridge you see the fort of Alang to the left and Madan to the right. Turning to the right we reach the steps carved out of the rock face going to the rock face of Madangad. From the end of the steps, one has to do a steep climb of about 40 feet to reach the upper route of Madangad. One has to use rock-climbing techniques to climb this patch. A bolt has been fixed in the middle of the rock patch to help climbers make an easier ascent. After the climb, the route turns left and goes up to take us right near the water tank on top of the fort. The second route to Madan is from Ghatghar. This route is via Ghoti - Bhandardara � Ghatghar. It takes 4 hours to reach the ridge between Alang and Madan from Ghatghar. One can stay on the fort in the cave, which can accommodate around 15-20 trekkers. Only two water tanks from which water would be available only till February. As the approach to the route contains rock patches, rock climbing equipment and good climbers are absolutely necessary.